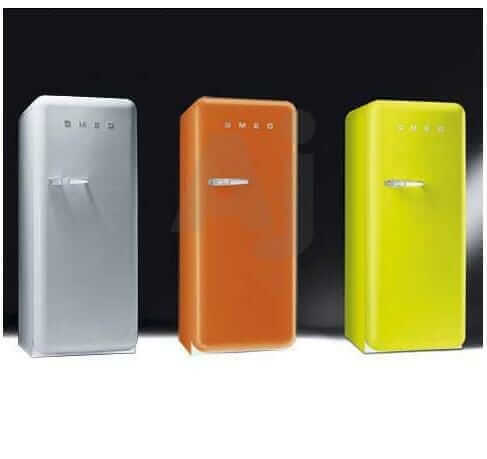 This looks to be a good refrigerator contender for a midcentury modern kitchen: It’s the Bosch 500 Series model B22CS50SNW and it has a number of features that I really look for: Side-by-side… counter-depth… Energy Star… in white. The only thing I don’t like is that ice-maker in the door… and while a lot of folks will balk at the $2,500 list price, (1) I’m guessing you can wait for a big sales event and get it for significantly less and (2) it’s still gonna be cheaper than the Sub-Zero. Why do I like these features? Side-by-side — I really like a side-by-side for a small kitchen — less door to have to wiggle around. Counter-depth — I like counter depth for similar reasons: Midcentury kitchens tend to be small, non-countertop depth are so honkin’. White is classic. Note: This refrigerator also is available in stainless steel. Free-standing — You can build it in, or not. Design — The lines are modern – yes, like the Retropolitan and my Sub-Zero, more Jetsons than Donna Reed. I have not seen this puppy in person — I wish I could see what that white exterior is made of. Nonetheless, from the website photos and description, it looks like one to consider if you’re doing a kitchen remodel or need a new fridge and have the space to work with. 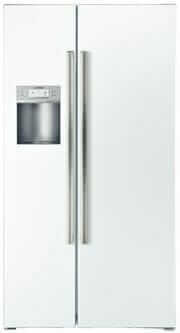 Link: Bosch B22CS50SNW counter-depth, side-by-side, Energy Star, white refrigerator. And, see all my other stories about refrigerators, stoves and other appliances and accessories suitable for mid century kitchen remodels here. Anyone buying a new fridge or getting rid of an old one should check with their utility company to see if they offer any rebates. Con Ed (NY) is currently advertising that they will give you $50 if you get rid of an old fridge, and they’ll even haul it away. Sorry, all you side-by-siders and stainless steel lovers. For me, there’s nothing on my retro kitchen horizon but a BIG CHILL. There just isn’t anything hotter for keeping things cold than that baby! I have a Kenmore that is very similar to this. I would never buy another counter depth unless I had to (which we had to in order to fit in our kitchen). It doesn’t hold enough and we have to have a backup fridge in our basement. (and there are only 2 of us using it!) 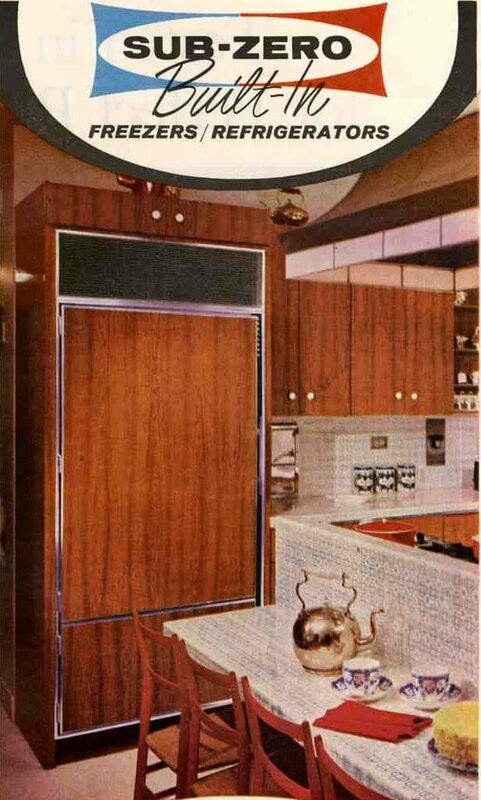 I am so glad they are FINALLY making flat surfaced fridges again. I refused to buy those wrinkled front fridges, not only are they ugly, but the surface attracts dirt! What is mid-century about that design, I don’t see it? By the way, counter depth refrigerators are really SMALL! I bought one because of space issues and I still have to use my old refrigerator in the basement for lots of stuff. Never again.